Let’s face it when it comes to kitchen appliances a microwave is pretty much essential. That being said, trying to find the best microwave is like walking on the beach trying to find the prettiest seashell. There are quite literally hundreds of thousands of different microwaves on the market, shoppers can quickly become overwhelmed with all the options placed in front of them both in-store and online. To help make the shopping experience a little easier on readers, we’ve not only decided to create a handy buyer’s guide on how to pick the best microwave oven, but we’ve gone ahead and did a little research of our own to create our list of best microwaves. One would think that buying such an essential piece of kitchen equipment would be a rather simple task, and for some, it can be.difficult. For the rest of us, when faced with the pure amount of options between brands, makes, models, and features… we can quickly become overwhelmed which can lead to making the wrong purchase. So, instead of letting our readers wander around stores and the internet blindly, we’ve compiled some important factors to make a note before they start their shopping journey. When it comes to purchasing a new microwave for your kitchen, you need first to consider which type will suit not only your family’s needs but the arrangement of your kitchen. Countertop microwaves are traditionally the most common microwaves amongst consumers. They are simpler to not only operate but to place in the kitchen. That is because they can be put on any countertop and moved at the user’s will. These microwaves are a great option for smaller kitchens with limited counter space. They come in a variety of different sizes. While they are great for limited spaced-kitchens, they do tend to be more difficult to install due to the ventilation requirements - a professional should be consulted to make sure all is well during and after installation. Drawer microwaves are another great option for those looking to free up some counter space in the busy kitchen. These microwaves are hidden away and pull out from the cabinet like a drawer. These are a convenient option because they bring things into a more accessible height and even allows users to stir items mid-cooking without removing them. Another aspect you’ll want to consider is the power requirement of the unit. Generally, the bigger the unit, the more power it requires. The power is represented in the number of watts. 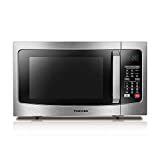 Most microwaves come in a range of 500 to 1,000 watts. The average wattage needed is between 750 and 800, but if you are looking for something that is capable of cooking more evenly and in a shorter amount of time, then you’ll want something with a little more wattage. No matter which microwave you choose, proper vitalization is a must. Most countertop microwaves require at least five or six inches of ventilation around the entire unit. Over-the-range units will require external and recirculating vent option depending on the specific unit you purchase. Drawer units come with built-in ventilation generally along the bottom of the unit. The size and cooking capacity of the microwave is also important because it will be dictated by your cooking needs and the overall space you have for it. You will want first to measure out space for your unit, and then also keep in mind your ideal internal cooking capacity. As far as other features go, you’ll have to narrow down what you need in a unit because features can be just as overwhelming as the number of microwave options on the market. Below, we’ve listed only a handful of the most frequently looked for features in some of the best microwaves. This feature allows users to simply choose the type of dish they want to make and the serving size they plan on making. Once chosen, the preset cook time and power level will automatically cook your dish. Sometimes this will be displayed as a menu option and other times; there will be designated buttons listed for users to push simply. These are microwaves that have a built-in heating element and fan that shortens the traditional cooking time. This feature allows users to select a preselected time to cook their food for. These are shortcut keys that help users choose the right time and temperature for cooking popular food and drink options such as popcorn and hot beverages. Some microwaves come with a nonstick interior coating that helps speed up the cleanup process. These are simply items that help to keep your microwave organized and help with warming more than one item at a time. Not all units come with these extras, so take your time shopping to see if these accessories are available for your desired unit. When it comes down to ranking products for our readers, we take the time to look into the product, the company name and what fellow consumers have had to say. That being said, when choosing our rankings, we considered the above factors and tallied up totals to reach an overall ranking, which we’ve listed below each product as a star rating. We took some time to do a bit of research of our own. This included looking at popular brands, makes and models of microwaves and looking into what consumers had to say. 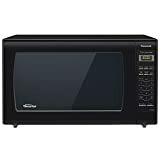 This Hamilton Beach microwave oven is a small microwave that’s not only simple to use but also features child-safe lockout buttons for added safety. This unit measures in at 17.3in x13.4in x 10.2 in, and weighs in at about 25lbs. The available cooking space is .7 cubic feet and uses 700 watts to run. Thanks to the six quick-set menu buttons, cooking and reheating your favorites is as simple as a touch of a button. 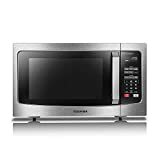 This Toshiba microwave measures in at 0.9 cubic feet and uses 900 watts to run, making it an ideal unit for smaller kitchens, dorms or an office break room. It also features a digital display and LED interior lighting. With six pre-programmed settings for popcorn, potatoes, frozen vegetables, beverages, dinner plate, and pizza, preparing some of your favorites is simple as ever. This unit also allows users to easily program multi-stage cooking through the simple to use control panel. This Panasonic Microwave Oven NN-SN936B Countertop with Inverter Technology and Genius Sensor make a stylish and convenient addition to any home. It is a larger unit, coming in with a 2.2 cubic-foot cooking capacity, a 16.5-inch turntable, and using up to 1250 watts. The patented Inverter Technology delivers a constant stream of cooking power at every temperature for more evenly cooked food. The Genius Sensor cooking button helps to take the guesswork out of cooking by automatically setting power levels and adjusting cooking or defrosting time by measuring the amount of steam produced during cooking. It then signals the microprocessor to calculate the remaining cooking time and the appropriate power level. This 1.6 cu ft. 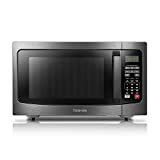 Stainless steel microwave oven features Panasonic patented Inverter Technology engineered for even cooking. This unit offers users up to 1250 watts of high cooking power and 18 different preset auto cook menu items. This Panasonic Microwave Oven NN-SN966S Countertop with Inverter Technology and Genius Sensor make a stylish and convenient addition to any home. It is a larger unit, coming in with a 2.2 cubic-foot cooking capacity, a 16.5-inch turntable that is thinner than other, similar sized models, and using up to 1250 watts. 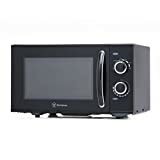 This Westinghouse microwave oven is simple to use and has mechanical dials to allow users to set a timer between one and 30 minutes and even to select from six cooking power levels. It has a cooking capacity of 0.9 cubic feet and has a power output of up to 900 watts. This is a great unit for anyone living in a small apartment or dorm. 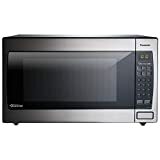 This Toshiba is a great microwave for smaller areas such as an office break room or a small apartment. It has 1.2 cubic feet cooking capacity and power of up to 1100 watts. With sensor reheating, users can cook up to six of the most popular food items all with a touch of a button. The large clock display not only functions as a digital clock, but also a countdown timer. 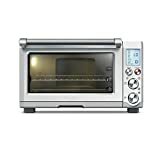 This Toshiba 1.5 cubic foot, 1000-watt stainless steel microwave convection oven has not only a spacious interior but also features both convection and microwave cooking. With sensor reheating, users can cook up to six of the most popular food items all with a touch of a button. This easy to use the microwave features smart setting that takes the guesswork out of cooking, reheating and defrosting foods. This unit features Sensor IQ that detects humidity and calculates cooking time accordingly and a variety of one-touch auto button that are pre-programmed for commonly used tasks. This unit is a 1.6 cubic foot, 1250-watt stainless steel countertop/built-in microwave that circulates heat in precision, ultra-efficient 3D waves for easier, more versatile food preparations. The patented Inverter Technology delivers a constant stream of cooking power at every temperature for more evenly cooked food. With these two technologies combined, this Panasonic unit allegedly provides the fastest, most efficient way to enjoy perfectly prepared foods across a wider range of cooking techniques, while still maintaining more of the natural nutrients and flavor users prefer. 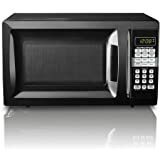 Searching for the best microwave to suit your needs shouldn’t be difficult. Once you’ve nailed down the size, type and features that you want in your new unit, shopping for it will become that less stressful. So, remember, know what you want and keep in mind the space you have for your new microwave and before you know it, you’ll be enjoying your new appliance!